Yesterday Joseph Sobol collected his figured Sitka spruce and African Blackwood 12 string bouzouki. This has been under discussion and construction for just about two years now. Joseph has previously had me build at least three 12 string bouzoukis (I’m beginning to lose count). For his two previous instruments, Joseph specified mahogany and Koa back and sides. This one has African Blackwood back and sides, along with a figured Sitka soundboard, as used on my Steinbeck guitars. And after playing it a while, when asked how he felt about it Joseph replied ‘this is the last’. He thought it looked and sounded great, and so did I. Being so newly strung, we know it will open out in the months and years to come. Dear Stefan— this new instrument is astonishing. By the time we got to York it had already opened up. You just have to touch it and it rings out like a choir and organ. Notes just leap off the board. Big day here in cittern world. Thank you for going out on the field one more time to make this magical thing. Here is the body, bound with black Rocklite and red/gold/green purfling. It is now ready for me to fit the neck, though it will be a little while before I can do this, I have other projects to complete first. You can see here that because the top and back are curved (the back more so), the sides are narrowest at the widest part of the lower bout. You can also see the greater depth at the neck end; this will give the heel more leverage and make sure the neck is stable. I have already built the figured Sitka Spruce soundboard, complete with braces, so now I prepare the back and sides to receive it. After trimming the excess back wood from around the lower edge of the sides, the tops of the sides are scribed and trimmed to receive the top. Then I fit the top lining and notch the lining on either side to to receive the brace above the soundhole. I check the fit of the top to the sides plus linings, adjusting where necessary; then lacquer the inside of the body. The back brace ends showing through the sides will be routed away with the binding channel and hidden by the binding. Now it is ready for me to glue the soundboard in place. And here is the soundboard in place, trimmed to match the sides and coated with shellac lacquer. 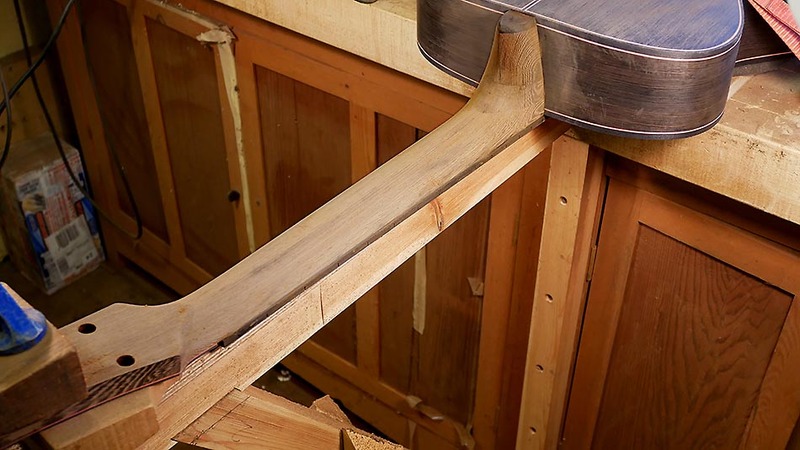 This ensures wood is not pulled from the grain when the binding tape is removed, and will be scraped off later. Here the back is clamped (using state of the arc clamps) and glued in place, having been turned over for cleaning up of the join. During his recent visit (described below), Massimo Raccosta and I discussed building a very slim guitar optimised for use with a pickup. He showed photos of a very slim classical guitar made by Hauser, though this went further than just having a fitted pickup. In the back of the guitar was a removable panel giving access to not only the pickup but also a tiny amplifier and loudspeaker. Not having heard this in action, I can’t give an opinion as to how it sounds. But in any case, this isn’t the concept we settled on. To start with, I prepared sides from Malaysian Blackwood, which works so well on my Steinbeck guitars. But I reduced the depth drastically. The sides are shallower than standard at the neck, but not too much so as body rigidity here provides stability for the neck. But towards the tail the sides are much shallower. The picture above shows the sides joined by neck and tail blocks, cut down to receive the back, and with the back lining fitted, and lining and sides notched to receive the back braces. Last week a truly enthusiastic Roman visited with his partner and was impatient to see Hadrian’s wall. Massimo and Francesca came from Verona Italy to collect a Steinbeck guitar to add to his huge collection of outstanding, interesting and historical guitars, both acoustic and electric. Massimo’s original plan was to visit in the spring but eventually came in late November – despite warnings about Northumbrian winter weather. In the event, we had a mixture of light rain, sunshine, heavy rain, and hail. Hadrian’s wall was built by the Emperor Hadrian (not personally, although he visited the site) around AD 125 and reached from coast to coast. It was the Roman Empire’s northern boundary. To avoid collusion with locals, it was Roman policy to man postings with troops from outside the area. These would be moved on regularly before too much fraternisation could occur. The weather on our visit was a fine example of why Roman troops would much rather not have been posted here. Especially those from North Africa. We followed our walk along the wall with a visit to the museum at Vindolanda. There Massimo saw, among many other items, letters home (on wooden sheets) from Roman soldiers asking for more socks. Massimo is originally from Rome and was thrilled to see the wonderful wall built by his ancestors. He wasn’t in the least troubled by the weather we encountered. Massimo standing by the famous Sycamore tree. If you saw the film ‘Robin Hood Prince of Thieves’ you will have seen this same view. It was supposedly on the route from France to Sherwood forest. Hmm. Said to have come from Japan via the US, this is a wonderfully simple and convenient way of gluing complex arrangements such as struts and braces. The springy rods (colour coded according to length) push up against the roof of the jig and down against the part to be glued. No actual clamps are needed, allowing good access for cleaning up any surplus glue. 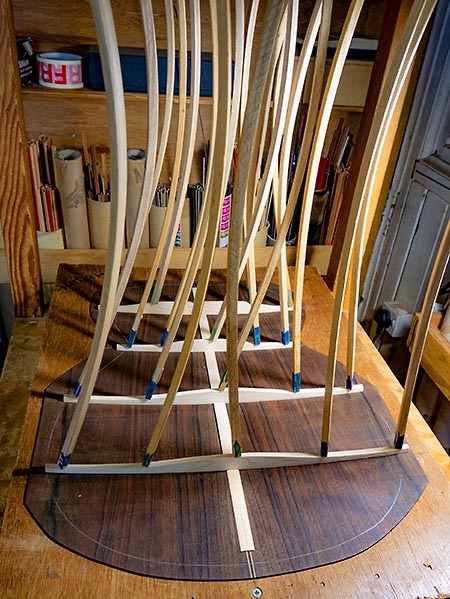 Here German spruce struts are being attached to a Malaysian Blackwood New World guitar back. My latest Steinbeck S. Bearclaw Sitka soundboard, Malaysian Blackwood back and sides, Wengé neck, ebony fingerboard and bridge, Gotoh 510 tuners with black buttons. Strung just 48 hours ago and it already sounds absolutely lovely. 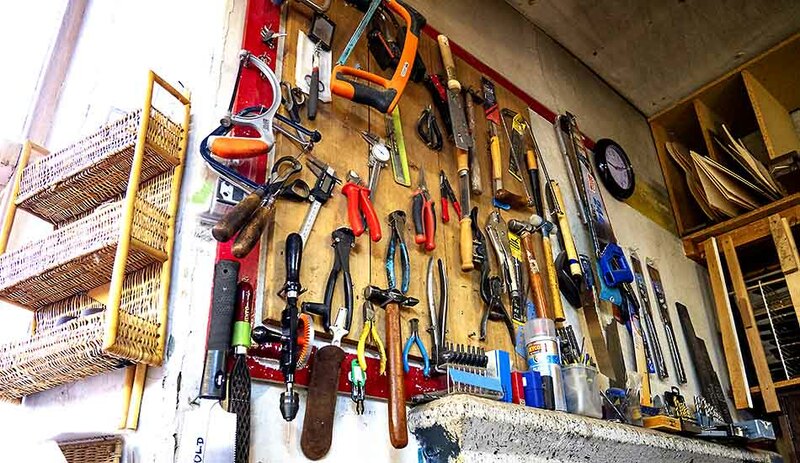 Hand tools, drill bits, measuring calipers and general bric a brac. Including items not quite thrown away over the last 40 years. Necks can now be shaped by CNC routers. These necks will be absolutely consistent and identical one to another. Hand carving a neck takes much longer, especially in a hard and uncooperative wood like Wengé. But hand carving tells me a lot about the particular piece of wood the neck is made from. And the profile can be adapted to suit the wood used, to suit the fingerboard and also the preference of the player. There are companies who could shape necks for me, but mine are all individually hand carved to suit the guitar they are part of, and always will be.